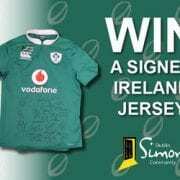 Ireland’s Six Nations dreams may be over, but Dublin Simon Community is offering one lucky person the chance to finish with a win ahead of the England game on Saturday, March 18th. We have an Ireland rugby jersey signed by the entire team to giveaway in the build up to the grudge match at the Aviva Stadium this weekend. Jamie Heaslip, Conor Murray and co. all feature on the jersey, which is a must have for any Irish rugby fan. It couldn’t be easier to enter and get your hands on such a valuable piece of sporting memorabilia. Make a donation of just €4 to Dublin Simon Community between Monday, 13th March and this Saturday, 18th March. The competition will close on Saturday at 3.30pm and the winner will be contacted and announced on social media early next week. To make sure that you’re specifically entered into the draw for the tickets, we’re asking everyone to enter the line ‘Ireland Rugby Jersey’ into the optional comment section on our donation page. The image below shows you the exact area of the donation page to add the key line so that you’re guaranteed to be entered into the draw for the jersey. Please also make sure to include your email and telephone number so that we can contact the eventual prize winner. 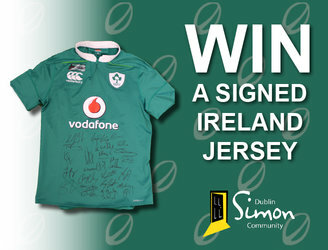 You can make a donation to Dublin Simon Community and enter the draw by clicking here. The competition will close on Saturday, 18th March at 3pm and the winner will be contacted straight away. If you fail to answer the call or call us back, then we will have to draw again and move onto the next potential winner. All of the money raised will go straight back into Dublin Simon’s services that help people experiencing homelessness in Dublin, Kildare, Wicklow and Meath.